While Maytag Quiet Series dishwashers are designed to operate without making a lot of noise, the annoyance of having a noisy dishwasher can be replaced by another annoyance if the dishwasher leaks when it runs. A leaking dishwasher is rarely a sign that there are major problems with the device. Maytag recommends that you troubleshoot the problem before calling for service. In many cases, you can fix the problem yourself without having to pay a repair person. Adjust the dishwasher legs to ensure the appliance is level. Turn the legs clockwise to shorten them or counterclockwise to lengthen them. 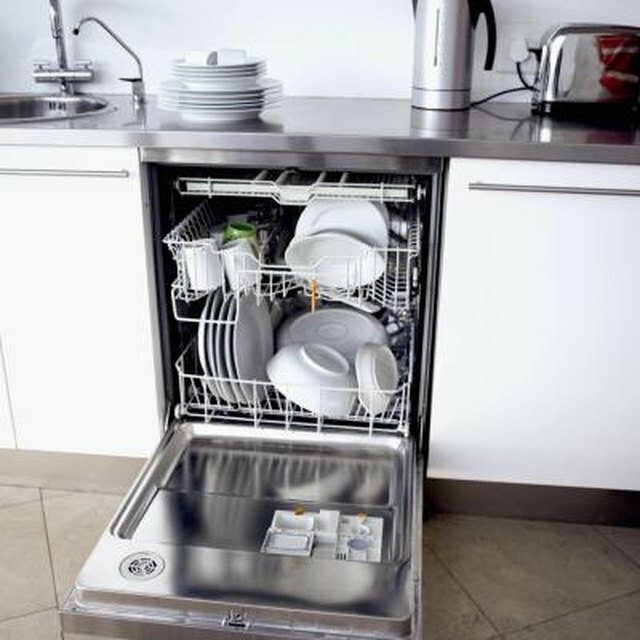 A dishwasher that is not level is more likely to lean and potentially leak some of the water from its tub. Measure the dishwasher detergent carefully when placing it in the dishwasher. Follow the recommended amounts listed for a load. Too much detergent causes an overabundance of suds, which subsequently leads to leaking. If your home has soft water, reduce the amount of detergent you use. Open the dishwasher door very slightly if you must open it after a cycle already has started. Wait for the water to fully stop flowing and for all moving parts to cease operation. Insert or remove an item if needed, then close the door. Failing to open the door in this manner when a cycle is washing will lead to water leaking on the floor. For the best results, don't open the dishwasher unless absolutely necessary if it's in the middle of a wash cycle. Press the dispenser lid so that it fully closes before you shut the dishwasher door. Failure to close this lid allows detergent to leak prematurely within the dishwasher.